Charles, 34, has beaten his personal best at every competition he attends. He has attended state and national events since 2012 and competes in the 2012/2013 Grand Prix series. Charles, born with Cerebral Palsy, which affects both his legs, has broken his personal best at each powerlifting competition he attends and aims top compete in an international powerlifting competition, representing Australia. Charles always wanted to try powerlifting when he was 18 but got busy with his studies and career as a civil engineer. 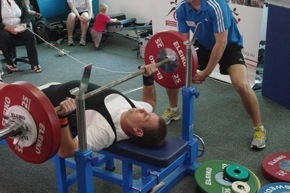 Charles is a committee member of the Townsville branch of Sporting Wheelies and during a meeting in August 2010, he was told there was a powerlifting bench in Townsville. He decided to learn more about the sport and began training. Charles has competed in state and national competitions as well as the Australian Grand Prix competitons since 2012. Charles is being awarded a development grant to assist him in continuing to improve in powerlifting. The advice he would give to other athletes is to go out and have a go, try to stick with your sport and success will occur in the long term.